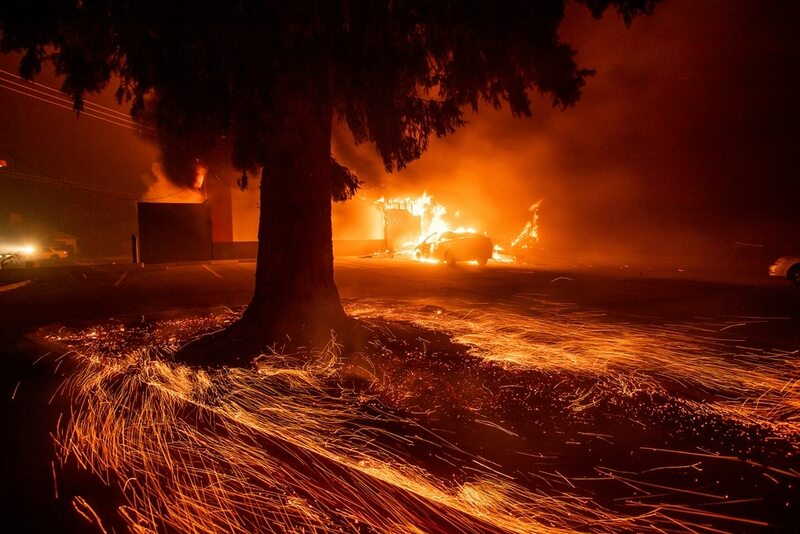 (Noah Berger | The Associated Press) Flames consume The Screen & Window Shop as the Camp Fire tears through Paradise, Calif., on Thursday, Nov. 8, 2018. Tens of thousands of people fled a fast-moving wildfire Thursday in Northern California, some clutching babies and pets as they abandoned vehicles and struck out on foot ahead of the flames that forced the evacuation of an entire town and destroyed hundreds of structures. Paradise, Calif. • A wildfire that moved so fast that firefighters couldn’t hope to stop it quadrupled in size Friday after destroying several thousand buildings and leveling much of a Northern California town of nearly 30,000 people, authorities said. Only a day after it began, the fire near the town of Paradise had grown to nearly 110 square miles, and authorities say they have found five people dead in vehicles torched by flames. Rural areas fared little better. Many homes have propane tanks that were exploding amid the flames. “They were going off like bombs,” said Karen Auday, who escaped. 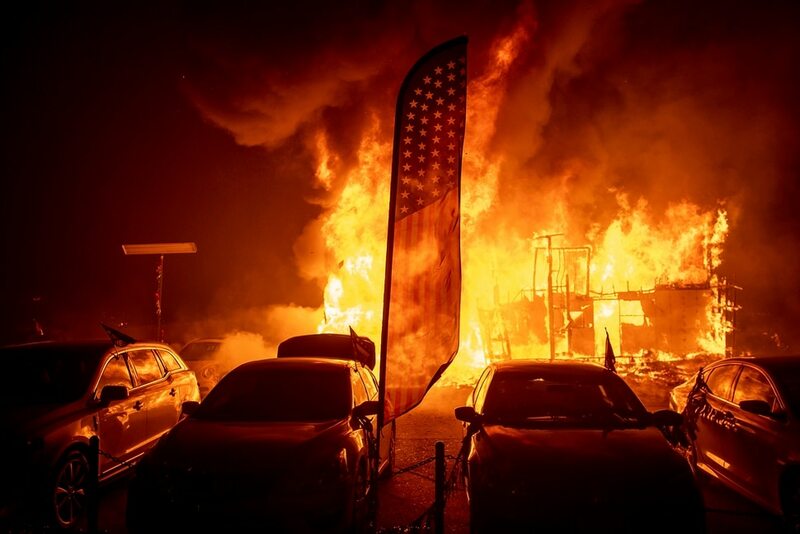 (Noah Berger | The Associated Press) Flames consume a car dealership as the Camp Fire tears through Paradise, Calif., on Thursday, Nov. 8, 2018. Tens of thousands of people fled a fast-moving wildfire Thursday in Northern California, some clutching babies and pets as they abandoned vehicles and struck out on foot ahead of the flames that forced the evacuation of an entire town and destroyed hundreds of structures. (Noah Berger | The Associated Press) Flames consume a Kentucky Fried Chicken as the Camp Fire tears through Paradise, Calif., on Thursday, Nov. 8, 2018. Tens of thousands of people fled a fast-moving wildfire Thursday in Northern California, some clutching babies and pets as they abandoned vehicles and struck out on foot ahead of the flames that forced the evacuation of an entire town and destroyed hundreds of structures. 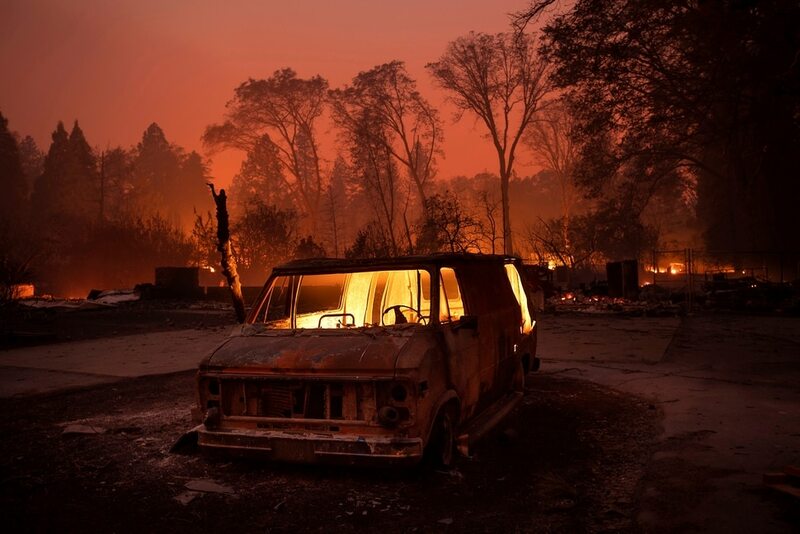 (Noah Berger | The Associated Press) Flames burn inside a van as the Camp Fire tears through Paradise, Calif., on Thursday, Nov. 8, 2018. Tens of thousands of people fled a fast-moving wildfire Thursday in Northern California, some clutching babies and pets as they abandoned vehicles and struck out on foot ahead of the flames that forced the evacuation of an entire town and destroyed hundreds of structures. 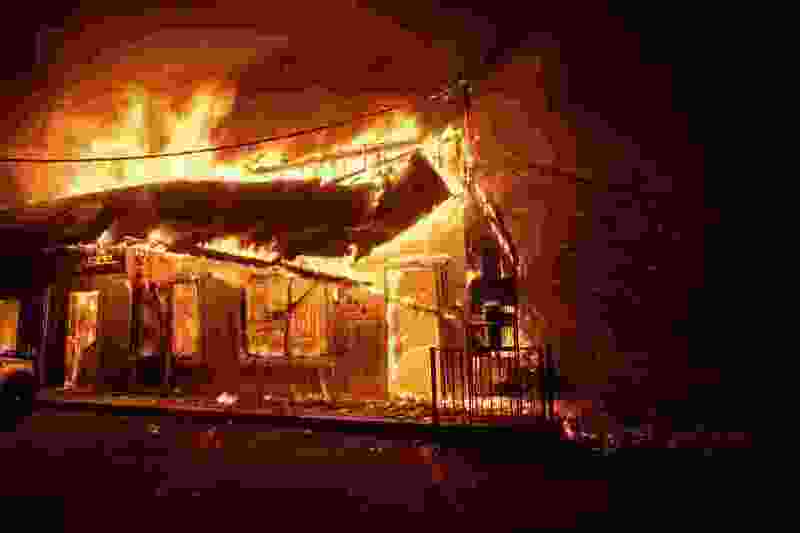 (Noah Berger | The Associated Press) Flames consume The Screen & Window Shop as the Camp Fire tears through Paradise, Calif., on Thursday, Nov. 8, 2018. Tens of thousands of people fled a fast-moving wildfire Thursday in Northern California, some clutching babies and pets as they abandoned vehicles and struck out on foot ahead of the flames that forced the evacuation of an entire town and destroyed hundreds of structures. (Noah Berger | The Associated Press) Flames climb trees as the Camp Fire tears through Paradise, Calif., on Thursday, Nov. 8, 2018. Tens of thousands of people fled a fast-moving wildfire Thursday in Northern California, some clutching babies and pets as they abandoned vehicles and struck out on foot ahead of the flames that forced the evacuation of an entire town and destroyed hundreds of structures. (Noah Berger | The Associated Press) Firefighter Adrien Mahnke pauses while battling the Camp Fire as it tears through Paradise, Calif., on Thursday, Nov. 8, 2018. Tens of thousands of people fled a fast-moving wildfire Thursday in Northern California, some clutching babies and pets as they abandoned vehicles and struck out on foot ahead of the flames that forced the evacuation of an entire town and destroyed hundreds of structures. (Noah Berger | The Associated Press) Firefighters battle the Camp Fire as it tears through Paradise, Calif., on Thursday, Nov. 8, 2018. Tens of thousands of people fled a fast-moving wildfire Thursday in Northern California, some clutching babies and pets as they abandoned vehicles and struck out on foot ahead of the flames that forced the evacuation of an entire town and destroyed hundreds of structures. Kelly Lee, who is looking for her husband’s 93-year-old grandmother, Dorothy Herrera, and Herrera’s husband Lou, who both live in Paradise. A California National Guard official said 100 military police are headed to Northern California to help evacuate people. Maj. Gen. David Baldwin said other military personnel are studying satellite imagery to asses the scope of the damage and map the fire.